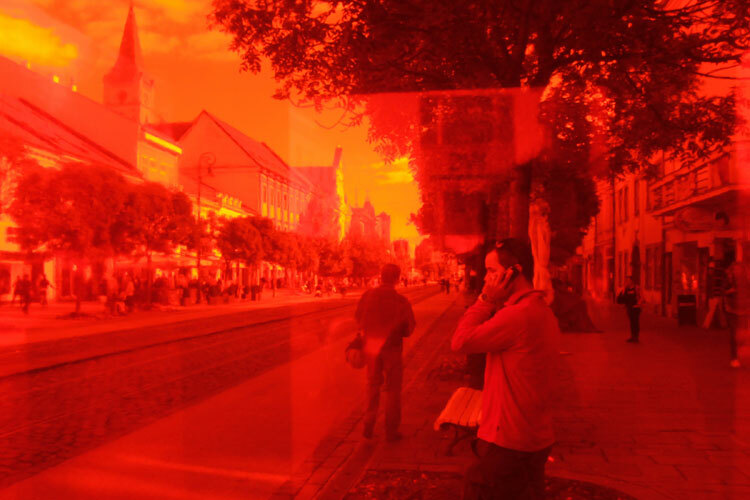 Kosice's main street, are transformed into sound and light experience stations, offering an intersensorial experience within public space. with colour and transparency films, resulting in changing light, translucency and mirror constellations, depending on the time of the day. For related works see a.o. RGB (2001), Klangbojen (2003), becuadro (2008), mil águas (2009), Sterngucker (2011). Commissioned by the Festival Sound City Days | Košice 2013 - European Capital of Culture. Supported by the Austrian Cultural Forum Bratislava. solo (Košice) is featured in Gal's book & DVD video Zwischenbrücken, edition spce | Gromoga, Austria 2015.